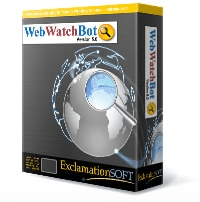 ExclamationSoft provides quick and accurate support for WebWatchBot for all of our customers through our online support system from a staff of knowedgable professionals. Phone support is avaliable on a per hour basis. Please contact our sales department for more detalis. The renewable ExclamationSoft ASA provides customers with a full year of support. Support is avaliable Monday through Friday 9am-5pm EST (+500 GMT) excluding United States holidays. Normal response times to inquiries are less 4 hours and no more than 24 hours during normal business hours. Please submit all support issues through our online system: http://www.exHelp.com. The annual renewable ExclamationSoft ASA provides customers with upgrade assurance, providing all upgrades at no extra charge regardless of the level of upgrade, e.g. v6.0 to v7.0 or v7.0 to v7.1. ExclamationSoft strives to continually improve and enhance our software through regular updates. Major updates generally occur every 9 to 15 months. An ASA's expiration anniversary date is determined by the date of the initial purchase. For example, if the initial purchase was made on January 1, 2013, the expiration anniversary date is January 1 each year. The first year's ASA is included with the purchase of a license. The expriration of the initial ASA is one year from the date of purchase. For example, if the initial purchase purchase is on January 1, 2013, the expiration anniversary date is January 1, 2014. An ASA can be renewed any time it is current and valid or up to the expiration/anniversary date. For example, if the initial purchase purchase is on January 1, 2013, the ASA may be renewed any date before January 1, 2014. If an ASA is expired, it may be re-instated up to one year after the expiration/anniversary date. For example, if the initial purchase purchase is on January 1, 2013, and the ASA is allowed to expire, it may be re-instated any date before January 1, 2015. Once re-instated, the anniversary date remains the same.